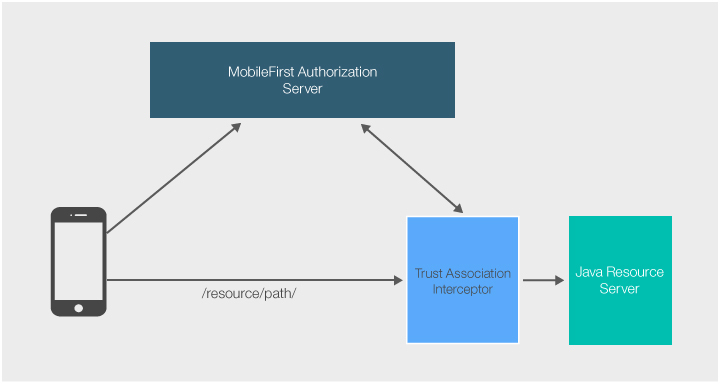 IBM Mobile Foundation provides a Java library to facilitate the authentication of external resources through IBM WebSphere’s Trust Association Interceptors. The Java library is provided as a JAR file (com.ibm.mfp.oauth.tai-8.0.0.jar). This tutorial shows how to protect a simple Java Servlet, TAI/GetBalance, by using a scope (accessRestricted). Be familiar with the Mobile Foundation security framework. Download the Security Tools .zip from the MobileFirst Operations Console → Download Center → Tools tab. In it you will find a mfp-oauth-tai.zip archive. Unpack this zip. Add the com.ibm.mfp.oauth.tai.jar file to the WebSphere Application Server instance inside usr/extension/lib. Add the OAuthTai.mf file to the WebSphere Application Server instance inside usr/extension/lib/features. Modify the WebSphere Application Server server.xml file to your external resource. authorizationURL: Either your MobileFirst Server (http(s):/your-hostname:port/runtime-name/api), or an external AZ Server such as IBM DataPower. clientID: The Resource server must be a registered confidential client. To learn how to register a confidential client, read the Confidential Clients tutorial. *The confidential-client MUST have the allowed scope authorization.introspect so that it can validate tokens. clientSecret: The Resource server must be a registered confidential client. To learn how to register a confidential client, read the Confidential Clients tutorial. cacheSize (optional): TAI uses the Java-Token-Validator cache to cache tokens and introspection data as values, so that a token that comes in the request from the client won’t need to be introspected again in a short time interval. The default size is 50,000 tokens. If you want to guarantee that the tokens are introspected on each request, set the cache value to 0.
scope: The resource server authenticates against one or more scopes. A scope can be a security check or a scope element mapped to security checks. You can deploy the project on supported application servers (WebSphere Application Server full profile and WebSphere Application Server Liberty profile). Set the scope of your securityConstraint scope to be the security check that your client needs to authenticate against.